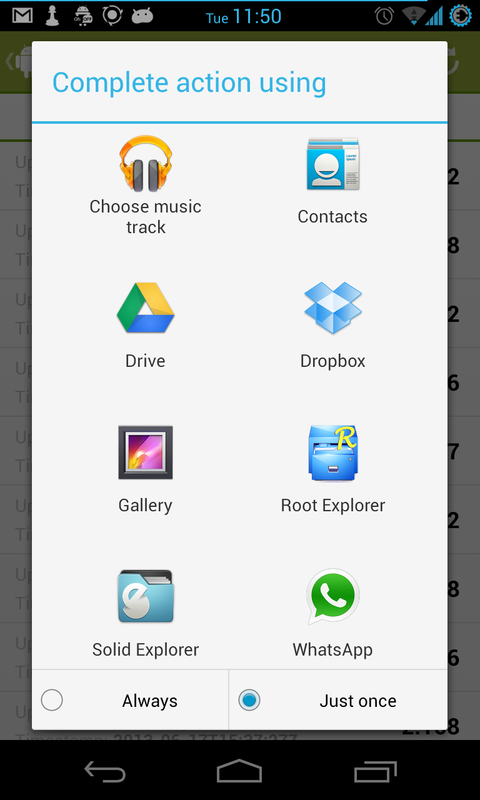 Android: How to open a specific folder via Intent and show its content in a file browser? I thought this would be easy but as it turns out unfortunately it's not. I have a folder called "myFolder" on my external storage (not sd card because it's a Nexus 4, but that should not be the problem). The folder contains some *.csv files. I want to write a method which does the following: Show a variety of apps (file browsers) from which I can pick one (see picture). After I click on it, the selected file browser should start and show me the content of "myFolder". No more no less. How exactly do I do that? I think I came quite close with the following code, but no matter what I do - and I'm certain that there must be something I didn't get right yet - it always opens only the main folder from the external storage. Please, be sure that you have any file explorer app installed on your device. EDIT: added a shantanu's recommendation from the comment. LIBRARIES: You can also have a look at these file/directory choosers libraries https://android-arsenal.com/tag/35 if the current solution doesn't help you. I finally got it working. This way only a few apps are shown by the chooser (Google Drive, Dropbox, Root Explorer, and Solid Explorer). It's working fine with the two explorers but not with Google Drive and Dropbox (I guess because they cannot access the external storage). The other MIME type like "*/*" is also possible. In code above, if setDataAndType is "*/*" a builtin file browser is opened to pick any file, if I set "text/plain" Dropbox is opened. I have Dropbox, Google Drive installed. If I uninstall Dropbox only "*/*" works to open file browser. This is Android 4.4.2. I can download contents from Dropbox and for Google Drive, by getContentResolver().openInputStream(data.getData()). Alas, the Files app currently contains a bug that causes it to crash when you try this using the external storage provider. Folders from third party providers however can be displayed in this way. final String filePath = fullfileName. But it's not so different from what you have tried. Tell us if it changes anything ? Also make sure the targeted folder exists, and have a look on the resulting Uri object before to send it to the intent, it may not be what we are expected. Not the answer you're looking for? Browse other questions tagged android android-intent folder android-sdcard or ask your own question. How to simply open directory/folder?